Small: Approx. 7 x 62"/18 x 157cm. Large: Approx. 9 x 76"/23 x 193cm. 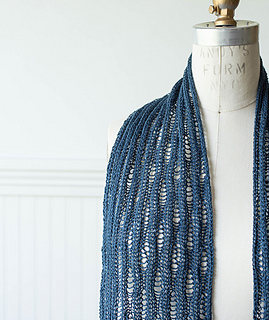 This free pattern turns what is usually an ‘oops’ into ‘gorgeous!’ We found this stitch in Barbara Walker’s Second Treasury of Knitting Patterns and we fell for it in a big way. 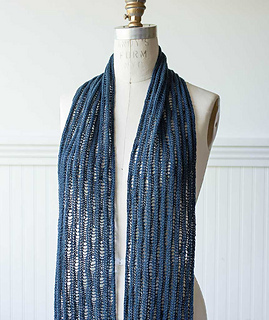 Extra stitches are created with a yarn over, then dropped and laddered down six rows later for a gentle, waterfall effect. Clever! 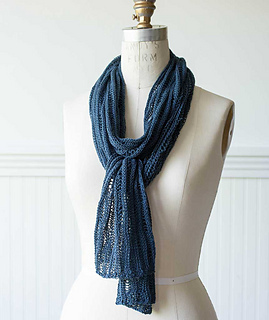 With sunny summer days in mind, we knit this scarf up in Louet Euroflax Sport. This fiber is one of the world’s finest linen yarns, gleaned from blue-flowering flax, known for stems nearly a yard long. It’s wet-spun, double-boiled, and then steamed for softness at a mill that’s been operating for generations. And it only gets softer wash after wash! Small: Approx. 7 x 62”/18 x 157cm. Large: Approx. 9 x 76”/23 x 193cm. Instructions given for small; large size in parentheses ( ). 1 (2) skeins Louet Euroflax #2 Fine/Sport Weight (270 yds/247m each); large size shown in Color 56 Marine. Or approx. 270 yds/246m (450 yds/412m ) of an equivalent sport-weight linen yarn. US 6 (4mm) needle, or size to obtain gauge. Approx. 22 sts = 4”/10cm in vertical drop stitch pattern, after blocking.